You shouldn’t have to pay for an expensive cable bill just because you’re a college sports fan. Thankfully, you don’t have to. More and more people are cancelling their cable subscriptions and turning to cheaper streaming services as an alternate to cable. These streaming services are like Netflix or Hulu, but offer the same live TV channels you get with cable for a fraction of the price. You can trade your hefty contract, monthly rental and cancellation fees, and an abundance of useless channels for a low monthly cost that you can cancel at any time. Since every streaming service offers different channel lineups for different prices, we’ve created this guide to make cutting cable easier. Similar to our 2018 Guide for the NFL without cable, this guide will outline the channels that play college football games and the different options for streaming them without cable. Is streaming college football reliable? A major concern for sports fans when cutting cable is the reliability of service during important games. If someone’s episode of Star Trek Discovery becomes a little shaky in the middle it’s quite annoying, but it’s unlikely they’ll miss a major a plot point in a short amount of time. As for sports, a single play can make or break a game. Missing the final shot at the buzzer or a once in a life time interception into game winning touch down due to stream quality is the thing of sports fan’s nightmares. Everyone’s heard stories about Dish users and missing out on the game because of a storm. No one wants to go there and nowadays, you don’t really have to. When most of the streaming services were launched they had numerous problems. They weren’t equipped for the user base, the hardware was mediocre, and the services had a lot to learn. Now that streaming service has been a major player in media for a few years, they’ve had ample time to improve their quality and reliability. If you look up reviews for some of the streaming services, you’ll likely find a handful of out-of-date guides claiming that these services are shoddy at best. No one can argue that that’s not how they were when the guide was written, but that’s no longer the case. We’ve personally streamed multiple important games, and have even watched every episode of Game of Thrones live on streaming services without any issues. Although not as popular as the Super Bowl, the season premier of Game of Thrones was streamed by over 6 million people simultaneously. Before we get into specifics for how to watch college football without cable, let’s take a quick look at the different streaming services we’ll discuss in this article. There are a lot of different options and they all have vastly different channel lineups, but we’ve tried to highlight the College Football channels that they offer. If you already know which channels you need (ESPN, Nick, FOX, etc.) and want to figure out the best streaming service for your family, our online tool is your best bet. 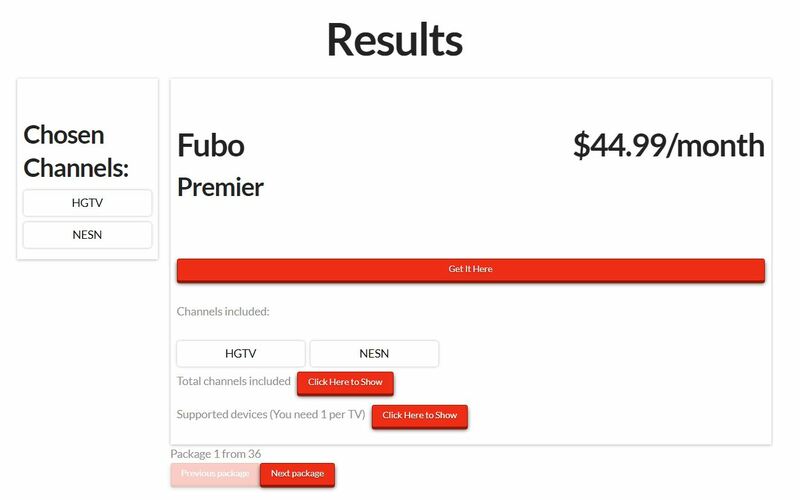 It let’s you input your location and requested channels into an online form and immediately displays customized results for the streaming service that best fits your needs. The best part is, it’s absolutely free! People are often surprised when we suggest an antenna as the best way to watch something without cable. However, if an antenna is an option it will most certainly be the cheapest. You might be picturing a pair of rabbit ear antennas on top of your grandmother’s old black and white TV and imagine yourself adjusting it every time there’s a storm. Although rabbit ears are a valid option for some people, antennas have come a long way in recent years. They are stronger than ever, well designed, more reliable, and the picture quality is typically higher with an antenna than what you get with cable. 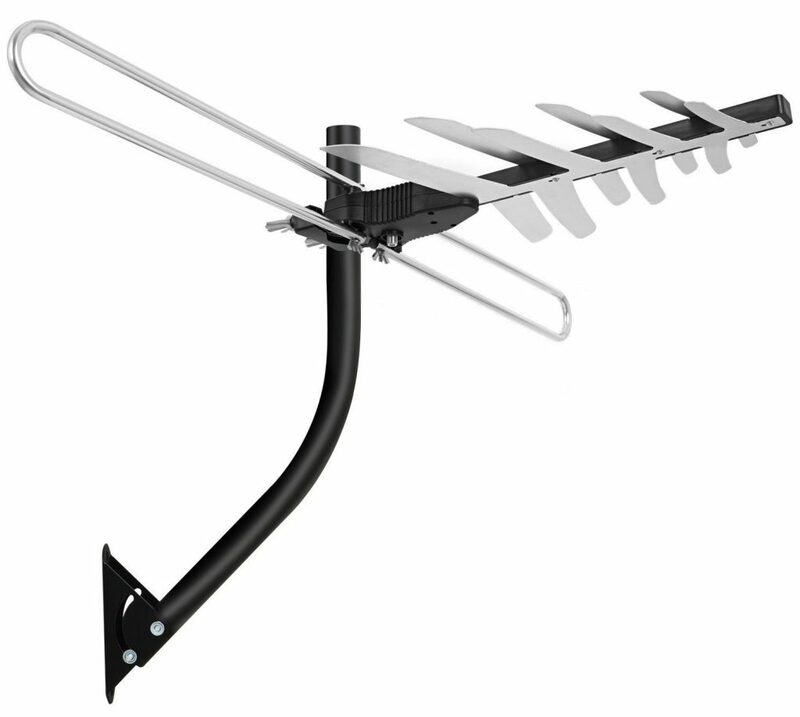 A one time antenna purchase will allow you to watch a lot of cable channels for free. In addition to popular cable networks like PBS and the CW, based on your location you may be able to pick up CBS, FOX, ABC, and NBC to watch a variety of college football games each week. The problem with antennas is that they are quite finicky. It’s almost impossible for us to suggest an antenna for you to purchase due to their reliance on location. Distance from signal tower, surrounding landscape, antenna height, and even the construction material of your home can have an impact on which signals you can pick up. Thankfully, there are a few websites that can help and will give you a quick idea of which channels you might be able to pick up as well as which type of antenna you need. The website we typically recommend is TVFool.com. Once you get to their form simply put in your address and hit submit. The results page is really dense with information, but for a quick review you only need to be concerned with the colored table. Take a look at the Netwk column to see the channels at your location and note their color. The image below is a broad idea of which type of antenna you’ll need. 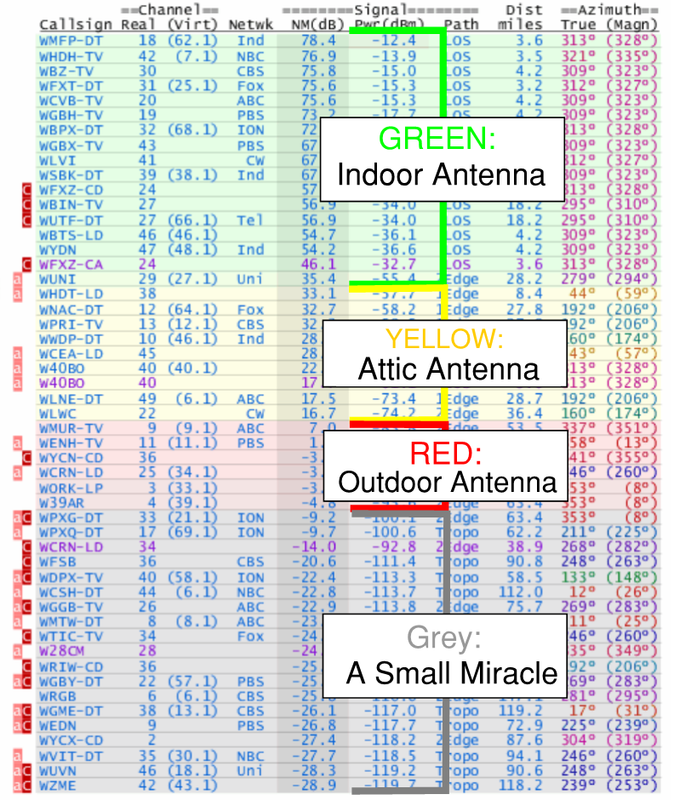 Once you figure out which type of antenna you need, feel free to check out our indoor antenna guide or our attic antenna guide to learn more about each type and to see our recommendations for each kind. 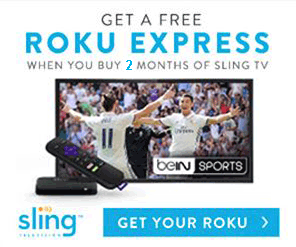 Sling TV is one of the biggest names in streaming and is the closest to being truly “al la carte” television. Their small packages are inexpensive and are meant to be combined to build a customized channel lineup that fits your needs. Their smallest base package is Sling Orange and has over 25 channels for only $25 a month. The most notable channels for College Football fans included with Sling Orange are the ESPN family of channels. These channels include ESPN, ESPN2, and ESPN3 that will give you access to over half of all college games, including bowl games, playoffs, and the National Championship. Although Sling does NOT offer CBS, they do have FOX and NBC in certain locations. Since Sling’s lineup of regional sports networks based on your location, so make sure you check out their website for yourself to make sure you get FS1, FS2, FOX, and NBC in your local market. Sling’s add-on packages also give you the ability to get Pac-12 Network, ESPNU, Goal Line, ESPNews, and ESPNU for a small additional monthly fee. If you’re not only interested in sports with Sling TV, their add-on package lineup combines similar channels into “genres” that you can add. These include outdoor stations, lifestyle channels, news channels, and even packages aimed at kids. They range from $5-$15 a month and can really help to keep everyone happy. Keep in mind that adding too many packages to your Sling subscription might make it a more expensive version of something else. If you add too many packages, you might find that one of the other services on our list offer the same things you’re looking for at a lower rate. This is why we recommend using our web application if possible, so that you don’t overspend on content you might not want. Sling is also a fantastic option in conjunction with an antenna. The major missing channel from Sling is CBS, a channel that you can likely pick up with your antenna. There’s a slight overlap of channels between what you can pick up with an antenna and what Sling offers, but Sling’s low price still makes it a great deal. Contrary to what the name may imply, PlayStation Vue doesn’t require a game console to use. PSVue is a streaming service created by Sony that was initially launched on their gaming system, but is now available on most streaming devices. If you’re currently a cable household or like to watch a variety of different cable channels, PlayStation Vue is a much smoother transition to cord cutting than an antenna or Sling. Instead of offering small combine-able packages like Sling, PlaySation Vue has four larger packages to choose from. These packages cost between $44.99 and $79.99 a month, but have significantly more channels than Sling Orange. Their smallest package, PlayStation Vue Access, is $44.99 a month and includes over 45 channels. Included in its channel lineup is FS1, FS2, ESPN, ESPN2, and some of the FOX Sports regional networks based on location. It also includes a lot really popular non-sports networks making it a fantastic choice as a complete cable replacement. A slight upgrade to their Core package will net you about 20 more channels for only $5 more a month. In addition to more regional channels like NBC Sports, NESN, SEC Network and plenty of others, the Core package adds the NFL Network, ESPNEWS, and ESPNU to its lineup. Some of the additional regional sports networks like NESN are actually quite difficult to get through streaming services and PlayStation Vue is one of the few that offers them. For even more sports action, PlayStation Vue offers add-on channels of it’s own, similar to Sling. Their Sports pack will add NBC Sports, NESN National, FOX College Sports, Long Horn Network, and a handful of others for only $10 more a month. One thing that separates PlayStation Vue from its competitors is it’s video quality and reliability. While they have experienced some outages (notably during the Super Bowl), their service is typically top notch in terms of reliability. In our testing and usage, we haven’t experienced any significant buffering, glitches or outages, and haven’t had any major interruptions. In addition, alongside DirecTV Now (discussed below), PlayStation Vue is one of the few services that offers a fair amount of channels at 60-frames-per-second. While not every channel is 60fps, PlayStation Vue is continuing to increase this list and it makes a huge difference when you’re watching sports. DirecTV Now is right up there with PlayStation Vue for the “most confusing streaming service name” award. You’re probably aware of DirecTV’s satellite service as an alternative to cable and assume DirecTV Now is the same thing. Although they are both options to watch live TV without cable, DirecTV Now doesn’t need a satellite. It’s a streaming service like Sling or PlayStation Vue that uses your internet connection and a streaming device to play live TV for a low monthly price. DirecTV Now’s packages are bigger than Sling’s, but less expensive than PlayStation Vue’s. Starting at $35 for over 60 channels, DirecTV Now is actually one of the cheapest services on a per-channel basis. As our web application continues to recommend services, we’re consistently surprised with how frequently DirecTV Now is suggested. You’d think that their abundance of channels for such a low price means that it’s chock full of useless channels that no one wants. However, that couldn’t be further from the truth. 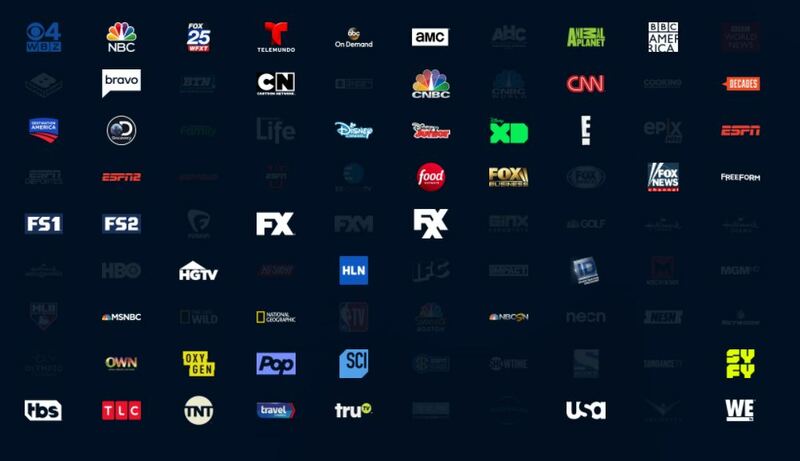 As you can see from their channel lineup below, DirecTV Now includes a lot of really popular stations. They offer plenty of local stations as well as some of most popular cable stations including HGTV, Disney, A&E, and Discovery. Another channel that many people request offered by DirecTV Now is Nick. You might think that including Nick isn’t a huge deal, but you’d be surprised at how few streaming services actually offer it in any of their packages, let alone their cheapest one. Notable channels for College Football fans included with DirecTV Now are ESPN, ESPN2, ESPN3, FS1, FS2, regional sports networks, and local NBC/FOX stations based on location. Make sure to visit their website to confirm local channel availability for yourself before signing up for the service and realizing you’re missing some important stations. Like most streaming services, DirecTV Now offers a free trial that will let you test the service before you buy it. In addition, DirecTV Now is currently offering 3 months of their Live a Little package for only $10 a month. If you plan to take advantage of the discounted rate you will have to sacrifice your 7-day free trial. Since $10 a month is essentially 2 months free anyway, trading 7 free days for 60 seems pretty good in our book. To help make watching your favorite college football team online even easier, we decided to list the difference conferences and the streaming services that offer them. Each section will show you how to watch the conference’s college football live online without cable. The Atlantic Coast Conference (ACC) has a broadcast agreement with ESPN until the 2026-2027 season. Any service that offers the ESPN family of channels is your best bet for watching ACC games. This means that Sling TV is going to be the cheapest way to watch the ACC without cable. A majority of the games will be played on ESPN and some of them may be broadcast on ABC. Although not every market gets ABC on Sling (check their channel lineup page to confirm for your location), you can watch ABC games on ESPN3 via Sling TV. If you’d like another option besides Sling TV that better fits your cord cutting needs, PlayStation Vue and DirecTV Now are also great choices to watch the ACC games online. The American Athletic Conference has a multi-year contract with ESPN to air all of its football through the 2019-2020 season. Any game that has two members of the conference or games that the conference member is the home team will be televised on one of the ESPN networks. These networks include ESPN, ESPN2, ESPN3, ESPNU, and ABC. If you do decide to use Sling TV, keep in mind that you might not be able to get ABC at your location. You can watch ABC games on ESPN3 through Sling, or you can look into an antenna if you’re close to an ABC signal tower. Like the ACC, DirecTV Now and PlayStation Vue are solid options to watch the AAC, but be prepared to pay a little bit more per month. ($35 for DirecTV Now and $44.99 for PSVue). 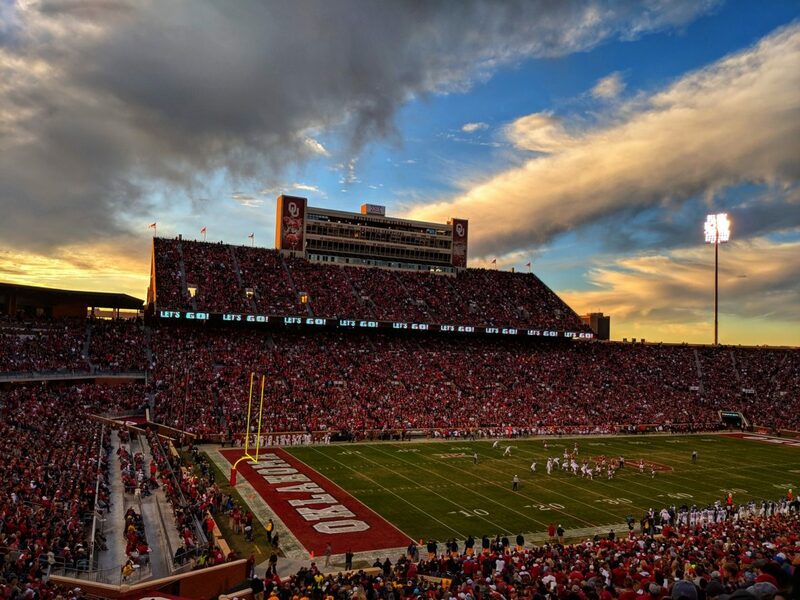 FOX owns the rights to the Big 12 games through the 2024-2025 season. All Big 12 games will be broadcast over-the-air on ABC and FOX as well as on ESPN, ESPN2, ESPNU, FCS, and FOX Sports 1. We recommend DirecTV Now over Sling TV for the Big 12 Conference because they are more likely to have FOX and the FOX Regional Sports channel than Sling. You should still confirm their channel lineup for your specific location to make sure you’ll get them. If not, you might be able to pick up both ABC and FOX with an antenna. Our recommendation is the 1ByOne 85 Mile Digital Amplified Antenna on Amazon and is inexpensive, powerful, and easy to set up. If you’d prefer not to use DirecTV Now, Sling TV, Fubo TV, and PlayStation Vue all have options to get the Big 12 channels. Hulu with Live TV is the go to watch the Big Ten without cable. Hulu is a little big more expensive than DirecTV Now, but is the cheapest option when you’re looking for the Big Ten Network. For only $39.99 a month, Hulu with Live TV will give you access to ESPN, ESPN2, ESPNU, ESPNews, Big Ten Network, FS1, FS2, and FOX/FOX Regional Sports based on location. Another option is to upgrade your DirecTV Now package to get Big Ten Network, but you’d be looking at paying $55 per month instead. YouTube TV and Fubo TV are also great options to watch college football online for Big Ten fans. We’re continuing to add the final conferences this week. Stay tuned!